Importance of stretching, the take away tip in Turbulence Training Day 18. Home fitness workouts that'll burn fat and sculpt your body in 4 weeks. 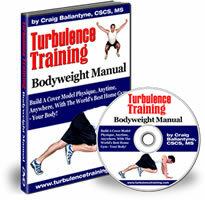 Welcome to day 18 of Turbulence Training's Buff Dudes and Hot Chicks fat burning workout. "Hello I'm Asad from Better4Fitness.com, and today's Day 18 of the Buff Dudes and Hot Chicks workout. It's another rest day with another park! I'm actually out with the day-care kids today (you can probably see them in the background), we've just been playing some football. It's good light exercise for me, and pretty vigorous exercise for them, they're only little! I thought I'd be more sore after yesterday, but I'm feeling alright and I put that down to a really good warm up and cool down. I really do spend a lot of time on the warm up and cool down, especially stretching at the end - I make sure I do it thoroughly. Even though I'm usually pretty spent, I make sure that I spend that 10 minutes at least stretching (importance of stretching). So that's it for today, I'm getting pounded by the rain so I'm gonna head off, I'll see you tomorrow, take care."